Update December 2, 2016: Bug fixed, packs are safe to open – but those who already did have received some more. 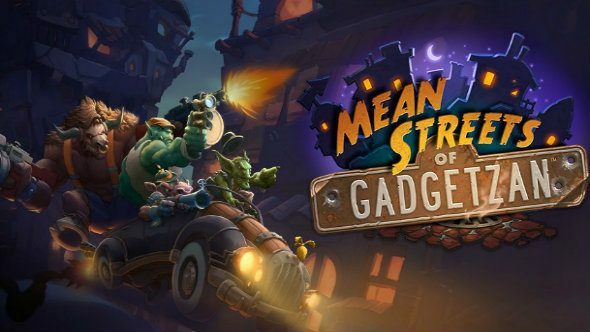 The launch of Hearthstone’s latest expansion, Mean Streets of Gadgetzan, wasn’t without its problems. Identified quickly by the streamers and fans opening hundreds of packs at a time, a bug was present on launch that caused the various tri-class cards to appear more frequently in packs. It was fixed speedily, and those that were hit by it have been compensated with extra packs equal to a third of the ones they opened while the bug was active. Check out our list of all the Hearthstone Mean Streets of Gadgetzan cards. This was announced via the Hearthstone forums and all packs have now been distributed – just log into the game and they should pop up on the open packs screen. It’s also the second time it’s been confirmed that packs are rolled upon opening, rather than when purchased or added to an account. If you’re just here for some free packs, there are six available just for playing a few games of Hearthstone now that the new set is out. You’ll need to win with each of the three gangs, three times, as directed by the quests when you log in. Original story December 1, 2016:If you’ve bought any Hearthstone card packs for the new expansion it’s a good idea to hold off opening them right now, as there’s a bug that gives you a high chance of getting a bunch of duplicates. There have been multiple reports of players ending up with Mean Streets of Gadgetzan packs almost full of tri-class cards, to the point where Blizzard have been forced to acknowledge the problem on Twitter. We are currently aware of reports of players having a higher chance of opening tri-class cards in MSOG packs and are looking into it. It’s best to hold off until Blizzard supply a fix, then. However, if you’ve already purchased packs, don’t worry – the cards only generate once you open them, so just sit on it for now. You only have to look at the replies to Blizzard’s tweet to see it’s a real issue. There’s no word on what action is to be taken just yet, but hopefully Blizzard offer some form of compensation for those affected.